Its a rough day on these seas my pirate brethren! The Moon is blood red and full and the waves tough as the best of warriors. Its #piratesunday and that can mean only one thing! Slak-Tor is here to updates us of our brave crews state on Devils Horn Island! When we left them the first leg of their excursion was a success, but then a horn blew. We were left to wonder about a "mass of death" and what it could mean for our heroes. Take it away brother Slak-Tor! The long blast of the horn had been disturbing and Tessaria's reply even more so. Captain K looked back at the elven woman. "What do you mean? A massing of death?" She hugged herself and shivered. "We have only seen this once before... The dead are being controlled. By who or what, I don't know, but that would explain the archers." Her voice was flat and cold. "Normally the zombies and skeletons are mindless, but we now have a new problem. Someone, or something commands them." "Oh, that's not good!" Sir Cornelius exclaimed. Her haunted eyes met his. "No... It's not..." she confirmed. The captain thought for a minute. "Can you tell Slak Tor to do a fly over of the island and see if anything has changed?" Tessa nodded and closed her eyes. "There they go!" First mate D pointed at the sky as the dragon made a soft turn to scan the land ahead. "All of them are moving to the center of the valley. The horn was a call to rally to one place." He explained. "So, both of you can talk to Tarakona?" K asked shifting his eyes between the elf and engineer. "Yep, we are both plugged in..." Cornelius replied distractedly. "Yeah.... She's right! They are all headed to the same place but..." He began. "They are all spread out, not traveling in tightly packed herds any longer." Tessa finished his words. "It has to be Tarakona, Captain." Sir Bentley interrupted. "Tightly packed herds can be taken out easily with a flame strike, but spread out, more would survive such an attack. Captain K sighed as his hard eyes scanned the landscape before them. "A killer force is mounting, we need to get there fast before they have a chance to assemble. We are also loosing light and I don't want to be here at night." He clenched his jaw. "Burn out everything around the vault to give us some time." "But, if the others move in, we will be surrounded." D reminded. "I know, but we have to retrieve the artifact. Hopefully we can be quick about it before the others arrive." "I suggest that Tarakona uses his fire on the outer forces... Leave those in the center be. We cannot afford to be surrounded." She offered. "May I ask why?" He asked in disbelief. "I can take care of most in the center. The spell will drain my strength and I can only cast it once at full power, but it is our best chance of being successful." She said sternly. K thought for a long moment and nodded. "Very well... Give the order." She inclined her head. 'Aye, Captain." Tarakona suddenly banked to a new course that led him and his rider away from the group. "I hope you are right about this..." K mumbled as he saw short bursts of flame burning unseen enemies in the distance. The group moved forward and soon found another sea of the dead waiting for them at the center of the island. K's blood ran cold at the sight of them. 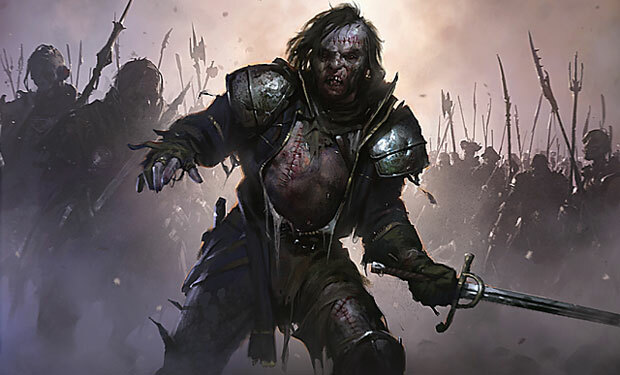 An army of the undead stood like statues holding their weapons, waiting for them. Thousands of red glowing eyes watched the party as they approached. "Now would be a good time to cast that spell." He said, eyeing the elf. "Not yet..." She sighed. " I will have to be among them for it to be fully effective." "In the herd?" K asked indignantly. "Yes, the deeper into the heard the better, but I don't have to be to far in to bring us a great advantage." Tessa explained. Lady Ravenhill suddenly spoke. "Let me take her into the heard." She demanded more than asked. "No, you are to important to risk. You and Tessaria are the key to this whole mission. I will not risk loosing you before we reach the vault." K argued. Her eyes smiled. "Captain, it is our time." She said in a reassuring voice. "Tessaria is the start of this final part of the journey and I am the last. You must trust us." K thought for a long moment. "What do you want us to do?" "Lord Slak Tor and Tarakona already thin the masses to our sides to help keep us from being flanked or surrounded. Keep us alive until we reach the edge of the heard and we will do the rest." "I don't like it, but so be it." He looked at the group. "Alright, you heard her, we are moving in." They drew closer to the front line of the dead. Zombies and skeletons snarled and raised the weapons, but a new threat could be seen among them. Pale white figures watched over the heard looking whole and as complete as they once were. They were fewer in number, but were more dangerous with their life draining magic. "Now!" Lady Ravenhill shouted drawing her blade and charged forward with the elf in tow. Twisting and turning she carved a path into the depth of the masses. Bear heeded to order to follow them. The massive warrior bashed the skulls of any who drew near with his oversized mace protecting their rear. Tessaria began to speak words of power when a blade penetrated the defense of Ravenhill's katana and the powerful mace slashing through her robes and slicing her upper arm. She cried out in pain, her building spell waned into nothing. Suddenly the distant roar of a dragon echoed across the valley. Fighting against the pain, she began cast her spell again. Bear gave off a blood chilling battle cry destroying her attacker and continued to fight against the building enemy. Tessaria's hands glowed in a silvery light and a white ball of light grew between her slender fingers. Invoking the name of her goddess there was a blinding flash of light radiating outwards from her like a shockwave. Bear shielded his eyes from the bright blast as zombies and skeletons exploded into clouds of gray dust. Even the wraiths shrieked in horror and turned to flee the divine light. Lady Ravnehill dropped her sword, doubled over crying out in excruciating pain. Bear looked at the veiled lady in alarm and took her in a protective hold. "Lady Ravenhill! What happened? Are you well?" He asked in shocked fear. Ravenhill leaned her head against his chest and relaxed as the light traveled outward around them. She gasped for breath and nodded. "I will be fine... Thank you..." She breathed but quickly recovered. "Please... I am fine." Her voice returned. Bear released her and she bent to retrieve her blade as he heard a sound behind him. He turned to find that Tessaria had collapsed. "Tessa!" He yelled, looking back to Ravanhill who now seemed perfectly normal and returned his attention to the fallen elf. He quickly stowed his mace and gently lifted Tessa in his arms. "My Lady... My Lady!" He called to her. Tessaria opened her eyes and smiled weakly, but only could groan in fatigue. He looked up to the rest of the approaching party. "Damn it! Tessa is down! Get over here!" He growled angrily. Captain K and the rest ran to catch up to them. "Is she ok?" Captain K asked in concern, eyeing the stricken elf. "I will be fine..." Tessa groaned. "I told you the spell would weaken me, but I will recover in time." She patted Bears arms. "I can stand on my own now." She assured the huge warrior. Regaining her feet she looked to the Captain. "I just need some time, but don't wait on me. Hurry before more come to stop us!" She urged. "We can't just leave you behind!" K argued." She swayed trying to keep herself steady. "I am to weak to carry on. I have done what is needed. Now go, before more come and stop us from finding the artifact and saving the world as we know it." She waved a dismissing hand. "I knew the price in coming here." K took her shoulders to steady her. "We are not leaving you..."
Tarakona suddenly landed next to them, but held out his leathery wings ready to take flight again. "Captain, bring her to me." Slak Tor asked calmly. "I will see to her safety until she recovers." K nodded and guided her to Tarakona's side. "Put her in front of me so I can keep her steady in the saddle." Slak Tor instructed. K took her by her waist and lifted her up as the dragon master secured her upon Tarakona's back. "Thank you Captain... Now let's finish this!" Tarakona took flight, carrying his charges to the safety of the sky as K looked to their situation. The battle field was almost clear of any undead. Only a few still watched them with red glowing eyes. "You heard him!" K exclaimed. "Let's finish this!" He growled. Oh my friends it looks as though this just went from serious to epic! Will our heroes reach the vault? Who is controling the dead? How will they find the artifact? How will they escape after they do? Only one way to find out my plundering partners! Tune in here next #piratesunday for the next thrilling arc of The Foundry!!! Please make sure to check out the @stokjockey supporter of #piratesunday and of all blundering pirates everywhere!! Wow!! The tensions build and he left us at the edge of,our seats!!! !